Social media is a great way to engage and connect with customers and potential customers. You can target your audience with a specific message engineered to create a response. Choose A Social Media Marketing Package That Fits Your Needs. SEOteric can help you develop a social media strategy that gets you in front of your customers on Facebook, LinkedIn, Twitter, Google, Instagram, and other top social platforms. Our approach will develop your specific tone and persona, and then create meaningful posts on your branded social channels. *The Visibility Package is for businesses that are looking for a solid social media strategy to build their brand on social media. This package is great for small businesses, local businesses, and businesses that want a more consistent social strategy. Local businesses fit well into this package. Social Profile Optimization SEOteric will set up and/or optimize your business's social profiles by updating images and info on each page to improve overall brand consistency and professionalism. 5 Social Profiles SEOteric will include 5 social profiles including Facebook, LinkedIn, Twitter, Instagram, and Google Posts. Other platforms (such as Pinterest, YouTube, etc) are available upon request. Strategy Development SEOteric will define and develop a social media strategy that assesses your needs, sets a benchmark, and identifies the goals and audiences of your social media plan. Competitive Analysis SEOteric will analyze your competitiors to identify local and industry specific tactics that are being deployed, and areas where we can fill in social coverage gaps within your market. Defining and Reporting KPIs We will define what success is for your brand, and set up tracking and conversion opportunities to identify key performance indicators for the campaign. 1 Post Per Week We will create one meaningful post per week equipped with custom media (images or video). 1 Amplified Post We will watch metrics to identify the post that is getting the most engagement and promote it to the existing fan base and to your target audience using demographic, location, and interest targeting. +4 Social Posts (+$200) For each group of 4 additional social posts, its an additional $200. +1 Amplified Post (+$100 each) Want to amplify more than 1 post per month? We can amplify each additional post for $100 each. *The Engagement Package is for businesses that are looking for more engagement on social media. This package is great for businesses that have some visibility and a growing fan base that needs nurturing. It takes the visibility package and expands into engaging the audience after posting. Social Profile Optimization SEOteric will optimize your business's social profiles by updating images and info on each page to improve overall brand consistency and professionalism. Post Engagement SEOteric will help initiate conversations, likes, and shares by engaging the audience. We can also employ focus groups that act as social ambassadors to ingite the conversation and engagement. 2 Post Per Week We will create one meaningful post per week equipped with custom media (images or video). 2 Amplified Posts We will watch metrics to identify the posts that are getting the most engagement and promote 2 of them each month for 1 week each to the existing fan base and to your target audience using demographic, location, and interest targeting to drive more exposure and engagement. *The Franchise Package is for multi-location buisnesses and franchises that are looking for a solid social media strategy that can be managed and kept consistent across multiple social channels per location. We help monitor and maintain brand consistency, visibility, and enagement. Customized Reporting You'll get individual location metrics as well as cummulative metrics for your brand. Social Listening We'll set up monitors to listen for brand mentions on social media and engage the audience. The basics of social media for businesses is quite simple. Be social. Share media. There are strategies on how to do both for different types of businesses but at its core, social media marketing is about creating conversations and engagement about your brand and with your customer base. Social Media like Facebook, Twitter, LinkedIn, Pinterest, etc. can help drive loads of traffic and create buzz when used effectively. Our mission for our clients is to create a persona for your brand, and leverage it to build community. That involves creating media opportunities that you can share and getting it in front of people. Studies have indicated that as much as 60-75% of website usage is geared toward social interaction, and getting visibility there is a big part of online success. 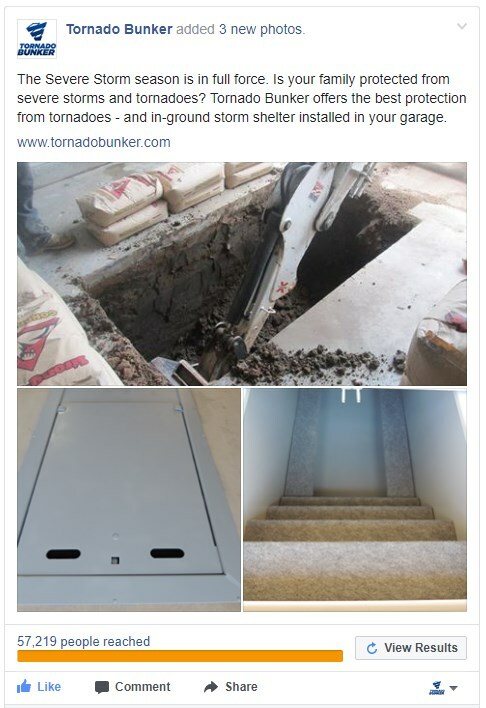 This story was a 3 minute video showing off a full days work installing a Tornado Bunker in-ground storage shelter. 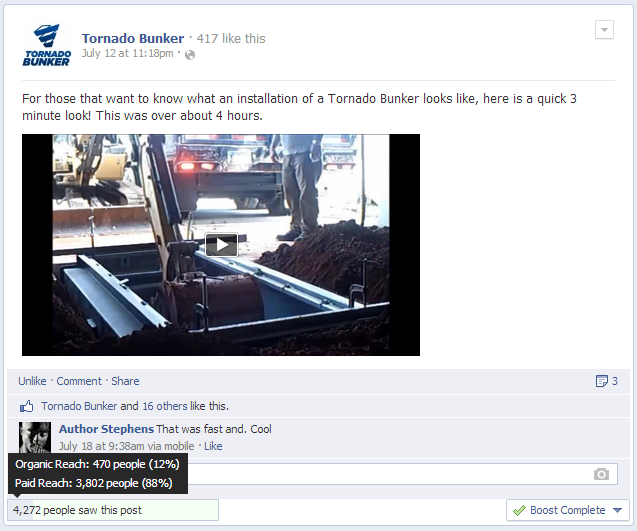 The post gained over 400 organic views and over 3800 paid views helping increase likes to over 400. Building your audience is the first step we take in social media marketing. Social media sites allow followers and friends, and in most cases, this is the collection of people that will routinely see your posts. For the DIY business owner, the best way to start is to leverage your existing relationships. Create a profile and share it with friends, family and customers. That will help establish your initial base of people. After you’ve shared your social profiles with those close to you, its time to broaden the net. Create a compelling story and promote it. Ask for fans. Use some images or video and tell your story and share it. Spend some promotional dollars and buy additional exposure, but set your demographics to hit areas that will care about your product or services. If people like your story and can connect with you, they will. Building an audience is about building relationships and sharing things people will care about. Social media influence is about community. Your goal is to turn customers into fans, so give them a reason to cheer for you. Find a way to connect your product emotionally. Get involved in your local community. Be charitable. Thank your customers publicly. Offer discounts. Share your story, and ask others to share it as well. As you go about your daily operations, think of ways to share that with your “friends” – take photos and videos, write things down, and tell the story to your friends on social media like you would across the dinner table. That’s how we help build community and influence. Social influence will begin to become a part of your culture, and that will help turn your customers into fans and a great source of referrals. Using a mix of blog post, shared links, and personal updates to create engagement. Using shared links (blog posts) and news to promote the brand. 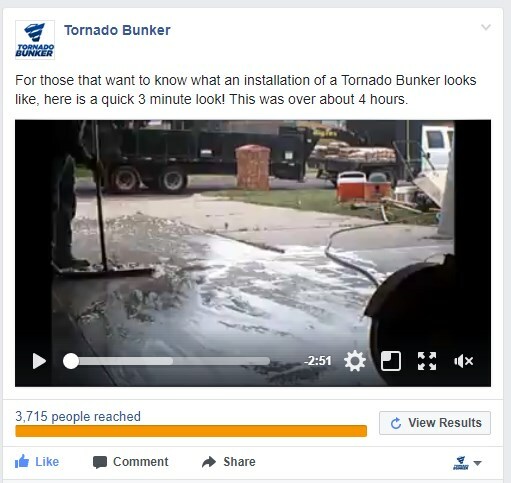 Using Live Video, news bulletins, and shared links to videos to get engagement. 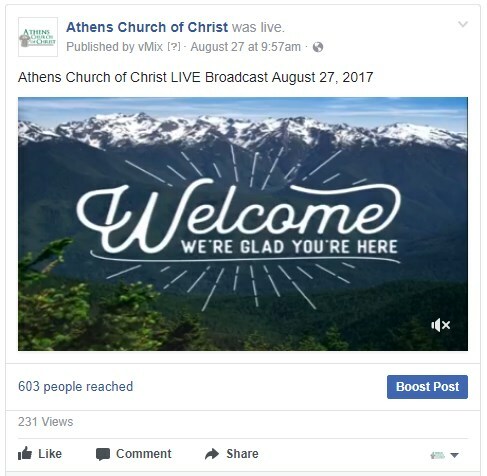 Leveraging Facebook Live to stream a live broadcast of church services (reaching hundreds more people per week). Use promotional videos to attract thousands of views.